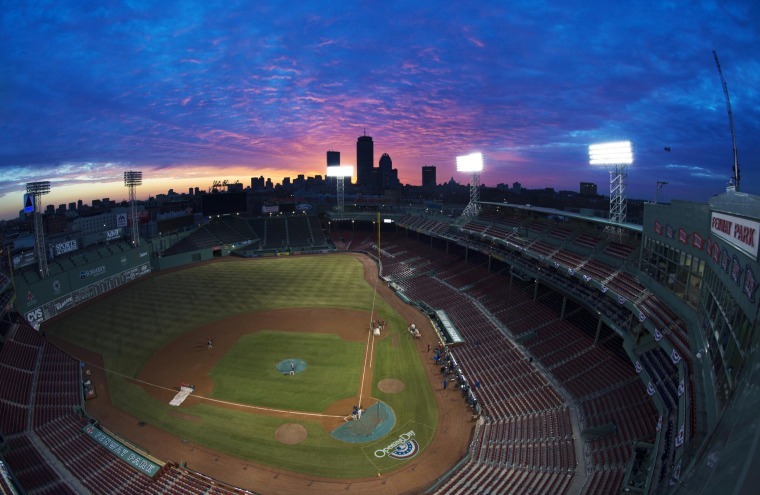 A 22-year-old woman was rushed to a hospital after falling down a Fenway Park elevator shaft at the end of a Boston Red Sox game. The baseball fan was standing near the fourth floor elevator when the one or both of the doors malfunctioned and opened prematurely Friday night. She fell down the shaft, landing on the roof of the elevator which was still on the second floor. Emergency crews responded to the incident at 11:17 p.m. ET after receiving a 911 call, Boston Fire Department posted on their Twitter feed. The power to the elevator was shut off to prevent it moving and firefighters entered on the second floor. Firefighters used a chair to boost themselves onto the elevator ceiling, and the victim was pulled to safety. The area was cleared within the hour and the woman was taken to Beth Israel Deaconess hospital. A representative from the hospital confirmed the woman's name is Lizzy Scotland. A state elevator inspector was called to the scene. The Red Sox issued a statement saying the accident occurred at the conclusion of a game against the Tigers, which the Red Sox lost. The extent of the woman's injuries was not immediately clear, but ESPNBoston reported she was in a critical but stable condition.